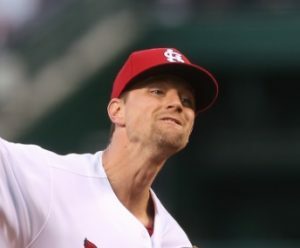 Four home runs and a solid start from Mike Leake propelled the St. Louis Cardinals to a 9-0 series finale victory in Philadelphia over the Phillies on Sunday. The Cardinals took two of three in the City of Brotherly Love and finished the road trip 6-3. Brandon Moss, Stephen Piscotty, Jedd Gyorko, and Jeremy Hazelbaker all went deep in the win for St. Louis. Leake tossed seven innings of shutout baseball, scattering seven hits and striking out eight. The Cardinals are off Monday and return to Busch Stadium on Tuesday starting a series with the New York Mets.